Here at Northern Virginiastan, we have written frequently about the Islamic Saudi Academy. Despite numerous problems, the school continues to operate without impunity or adequate investigation. Most politicians and our own State Department refuse to hold the ISA accountable. But one Congressman is trying! U.S. Representative Frank R. Wolf (R-10) has again called for a thorough investigation and review of curriculum textbooks being used by the Islamic Saudi Academy citing the U.S. Commission in International Religious Freedom's claim that they "promote violence and intolerance." In a September 16 letter to U.S. Secretary of State Condoleezza Rice, Wolf chastised the State Department for not answering his previous letters on the Saudi Academy textbook issue and for ignoring his plea to have the controversy settled prior to the commencement of the 2008-09 school year. "I write to let you know that I just received my first response from the State Department after having written three letters over a two-month period regarding the Islamic Saudi Academy and concerns raised by the U.S. Commission on International Religious Freedom (USCIRF) on the content of textbooks being used there," Wolf wrote. "After seeming inattention to these concerns, the letter my office ultimately received in response did not address my repeated requests that you convene a meeting of relevant State Department and USCIRF representatives -- to include the expert analysts commissioned by USCIRF to translate and interpret the ISA textbooks as well as any analysts commissioned by the State Department...to conclusively determine what is being taught at ISA," he stated. To buttress his request, Wolf included a recent report by the Heritage Foundation that stated "ISA is subject to the terms of the Foreign Missions Act" and that it is in the State Department's powers to declare ISA "a foreign mission of the Kingdom of Saudi Arabia." IN THE LETTER to Wolf, signed by Matthew A. Reynolds, Acting Assistant Secretary, Legislative Affairs, the State Department indicated that, although they had not answered previous inquiries about ISA in writing, they had kept Wolf and his staff informed of their actions. "Your letters have raised important issues. We have appreciated the opportunity to discuss these with you and your staff in recent months. No government should produce materials that are intolerant of religious, racial, or ethnic groups, nor include such material in its educational curricula," Reynolds wrote. When questioned as to why his letter seemed to indicate that no contact had been made by the State Department relative to his ISA inquiries, Wolf insisted, "The State Department has never been by my office." However, he did not confirm or deny any contact between his staff and the State Department over the period of time of his correspondence with Secretary Rice. "The matter is very simple. If there is no problem with the textbooks than the State Department should act to remove the cloud. If there is a problem then remove the books," Wolf said. "Two scholars from the Religious Freedom Commission have looked at these text books and they say there is a problem. It needs to be resolved one way or the other," he said. Reynolds also pointed out to Wolf that, "the school has reported that it is in the process of adopting new religious curricula and textbooks for the 2008-09 school year. The ISA has stated publicly that the new school year's textbooks are currently being reviewed by professors at two American universities." Neither the professors nor their universities were identified by Reynolds in his letter to Wolf. DEBATE ABOUT the school's curriculum and textbooks ignited in October 2007 when the Religious Freedom Commission issued a report calling for the school's closure "until such time as the official Saudi textbooks used at ISA are made available for comprehensive public examination." The Commission also sought intervention by the State Department and the Fairfax County Board of Supervisors. The school building at 8333 Richmond Highway, is leased from Fairfax County. That lease recently came up for renewal and was renewed for one year with an option for two one year extensions on a motion from Mount Vernon District Supervisor Gerald Hyland, in whose district the school is located. ISA's Director General Abdalla I. Al-Shabnan, who heads the school, has insisted all along that the textbooks do not contain hate and violence imbedded within the subject matter. He has also insisted that the textbooks of ISA are not those supplied by the Saudi Arabian government. At the outset of the controversy, Hyland had a specialist in Arabic review the texts. Her report concluded that the curriculum texts did not, on their face, contain offensive language pertaining to hate, violence and religious intolerance. However, she did conclude that certain passage should be expunged because they could be misinterpreted. Al-Shabnan submitted the curriculum texts to two independent university scholars to have them analyzed and evaluated. A report on those findings was to have been delivered to Hyland's office no later than Monday, Sept. 22. As of late afternoon Sept. 23 the report had not been delivered and phone calls to ISA and Al-Shabnan office were received by voice mail with no call back. "We have not received the report or any explanation from the Academy as to why we have not received it," said Brett Kenney, chief aide to Hyland. The entire matter including both the textbook issue and ISA's lease renewal was further complicated early this past summer when Al-Shabnan was arrested as a result of his failure to report a complaint from a five year-old female student that she was allegedly being sexually abused at home by her father. Virginia law requires reporting of all such accusations by school personnel. Al-Shabnan was originally charged with two misdemeanors of failing to report and obstruction of justice. He said that he did not believe the girl and advised the parents to seek psychiatric help for her. However, he also ordered the school's computers to be purged of any report about the complaint. In the final analysis he was fined $500 on the failure to report charge. The school also instituted an in-depth training program for all personnel on Commonwealth requirements dealing with such matters. Following the vote to renew the lease, Fairfax County Board Chairman Gerald Connolly sent a letter to Secretary Rice asking the State Department to make a determination not only on the textbook matter but also the lease renewal. He noted that during the Board’s public hearing on the lease no objections were voiced by the State Department or the Commission "regarding either the renewal or the textbooks." A reply from the State Department stated, "No authorization from the Department to renew the lease is required. The Department has not used the Foreign Missions Act to regulate private pre-school, elementary and secondary school curricula." Actions by the State Department on Wolf's requests remain unresolved. What is it going to take to get our government, which is sworn to protect us, to take a hard look at the Islamic Saudi Academy? Listen to The Gathering Storm Radio Show, which WC and I cohost. The show broadcasts live every Friday beginning at noon, Pacific Time. Friday, September 26 (60 minutes): Our scheduled guests are Ann of Refugee Resettlement Watch and MK of Down Under on the Right. Listen to the September 26, 2008 edition of The Gathering Storm Radio Show, live or later, by CLICKING HERE. Thursday, September 25, at 8:00 P.M. Phoenix time, WC and I will host "Voices of Freedom," a one-hour weekly show on KFNX 1100. See this time-zone chart (Refresh the page!) if you are in a different time zone than Phoenix, Arizona; click directly on the word "PHOENIX" to get a world map of time zones. Our scheduled guest is Dr. Paul L. Williams. Tune in if you can! In addition to AM air time at the scheduled hour, KFNX offers live streaming at the station's web site. VOICES OF FREEDOM: THE SHOW THAT MAKES JIHADISTS CRY. Addendum: CLICK HERE to access the download for the September 25 show. Friday, September 19 (90 minutes): Max Publius of the blog Brave News World will be with us during the first half hour. Our guest at the bottom of the hour is Glen Jenvey. Read his bio HERE. His web site is Al Qaida-Exposed, which offers numerous videos and articles related to Mr. Jenvey's undercover work in combating terrorism. 1. Max Publius, a veteran, will discuss with us inversionism, the process in which an ideological group finds to its horror it has allied with or even become the "boogyman" it has assailed previously and his views about the Iraq War, in which he served in our military. Glen Jenvey worked for several military attachés covering terrorist groups, including al-Qaida and their members in Britain. His sting led to the capture of Abu Hamza al-Masri, a major terrorist. Multiple other terrorists were also caught due to his efforts. He has been profiled and interviewed in major media across the globe, including in the US, UK, Russia, India, etc. He co-authored the book "War of the Web" with Jeremy Reynalds. Mr. Jenvey also appeared as an interviewee in the film Obsession: Radical Islam's War Against The West. Listen to the September 19, 2008 edition of The Gathering Storm Radio Show, live or later, by CLICKING HERE. Sami al-Arian, one of the nation's most prominent terrorism defendants, was about to be released into his daughter's custody to await a new trial on contempt charges. Assistant U.S. Attorney Gordon Kromberg protested, saying that "in this particular culture," a woman could not prevent her father from fleeing. U.S. District Judge Leonie M. Brinkema lashed out at the prosecutor, calling his remark about the Muslim family insulting. Earlier, she had chastised Kromberg for changing a boilerplate immunity order beyond the language spelled out by Congress and questioned whether Arian's constitutional rights had been violated. "I'm not in any respect attributing evil motives or anything clandestine to you, but I think it's real scary and not wise for a prosecutor to provide an order to the Court that does not track the explicit language of the statutes, especially this particular statute," Brinkema said at the hearing in the Alexandria courtroom. Andrew McCarthy understands what's at stake. But with judges such as Brinkema sitting on the bench, all of us are less safe and more of these jihadists will continue to escape our legal system. ...Kromberg's highest-profile case since joining the office's new terrorism unit after Sept. 11 was what prosecutors called the "Virginia jihad network," 11 Muslim men convicted on such charges as preparing for holy war by, among other things, playing paintball. Justice officials hailed it as a classic post-Sept. 11 case of prevention, but civil libertarians and some Muslims said it targeted Muslim men. Fact check! They were Moslem men waging jihad! Their motivation came from the Koran. But the Arian case escalated the tension. Arian pleaded guilty to one count of supporting Palestinian Islamic Jihad in Tampa in 2006 after a federal jury acquitted him or deadlocked on other counts. The judge who sentenced Arian to 57 months in prison called Arian a "master manipulator" who had been a "leader" of the terrorist group. Kromberg sought Arian's testimony in the Islamic charities probe and refused to delay his appearance until after the Muslim holiday of Ramadan because, he said, that would aid the "Islamization" of the courts, according to an affidavit filed by one of Arian's attorneys, Jack Fernandez. Prosecutor Kromberg is stating a fact. And saying so gets him branded as an Islamophobe. Leftist judges don't want to know the facts about Islam and don't want those facts brought out in court, either. No wonder so many of the "terror trials" end in acquittals and mistrials! 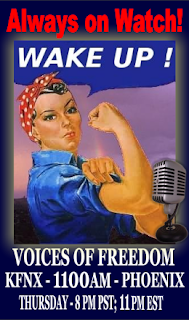 Tonight, September 11, at 8:00 P.M. Phoenix time, WC and I will host "Voices of Freedom," a one-hour weekly show on KFNX 1100. See this time-zone chart (Refresh the page!) if you are in a different time zone than Phoenix, Arizona; click directly on the word "PHOENIX" to get a world map of time zones. Tonight's guest is "Mohammed Abdul." The left would like for all of us to forget 9/11 and to ignore the threat of Islamic terrorism. Some reading: rebuilding lives after 9/11 — a love story. Friday, September 12 (60 minutes): Our scheduled guest for the full hour is Colonel Gordon Cucullo. Read his bio HERE. Colonel Gordon Cucullo — author, commentator and speaker and an authority on military affairs, current events, cultural dynamics, politics, and international business affairs — will discuss war scenarios with radical Islam. Listen to the September 12, 2008 edition of The Gathering Storm Radio Show, live or later, by CLICKING HERE. Friday, September 5 (60 minutes): Our scheduled guests are Resa Laru Kirkland, aka "Resa The War Chick," and graphic novelist Bosch Fawstin. Resa is a military historian and has appeared as a guest on The Armstrong Williams Radio Show and The Mike Reagan Radio Show. You can read more about Resa HERE and HERE. Her Blogger web site, America's War Chick, is HERE. Bosch Fawstin, Eisner Award nominee, is a cartoonist and the author of the graphic novel Table for One. 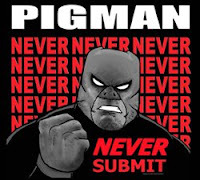 He is currently working on his second graphic novel, The Infidel, about twin brothers whose Muslim background comes to the forefront of their lives on 9/11; one brother responds by creating a counter-jihad superhero comic book called Pigman, as the other surrenders to Islam and becomes a born again Muslim, following the faith to wherever it leads him. Mr. Fawstin's web site is HERE; his blog, The Infidel Blog, is HERE. Listen to the September 5, 2008 edition of The Gathering Storm Radio Show, live or later, by CLICKING HERE. 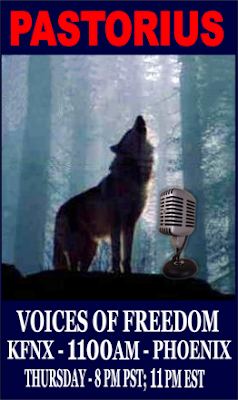 Tonight, September 4, at 8:00 P.M. Phoenix time, Pastorius, webmaster of Infidel Bloggers Alliance, will host "Voices of Freedom," a one-hour weekly show on KFNX 1100. See this time-zone chart (Refresh the page!) if you are in a different time zone than Phoenix, Arizona; click directly on the word "PHOENIX" to get a world map of time zones. Tonight's guests are Bosch Fawstin and Alyssa A. Lappen.